Hyperion Books for Children, New York, 2016. 64 pages. Alas! Alas! The final Elephant & Piggie book is here! However, it’s a good one, and a nice cap to the series. 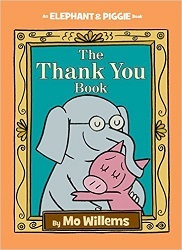 The Thank You Book is about thanking everyone. And Piggie means everyone. Every minor character who has ever appeared in the series shows up in this book. Piggie thanks Snake for playing ball with her, Squirrels for great ideas, and Doctor Cat for being a great doctor. However, Gerald insists that Piggie is forgetting someone – someone very important. It turns out that important person is not who readers expect. This is a lovely finish to the series – if it had to finish. Piggie says that she is one lucky pig. Readers out there are tremendously lucky readers! This entry was posted on Thursday, June 9th, 2016 at 11:06 pm and is filed under Animal Characters, Picture Book Review, Starred Review. You can follow any responses to this entry through the RSS 2.0 feed. You can leave a response, or trackback from your own site.